There are a few times when one fails and you take a moment to understand why. That cascades into a realization about what the project needs and the steps to make it a reality. This past week we did not get through the Initial Concepts challenge, yet I believe that has given us a needed push towards the future.When preparing for the presentation I made a grave mistake regarding the purpose of the presentation. My thought process was that we only needed to present the ideas to the main professor to prove that we had an early concept that could move forward. Now I realize that we needed to show that we created a prototype able to move forward instead. The difference between these two perspectives is both simple yet potentially confusing. One requires more preparation and display of our thought process while the other simply displays the required pieces. Another aspect that I didn’t take into consideration before the presentation was how the team was used to, and comfortable with, presenting. Each person presents in their own style. If I had to give a name to my style I would call it ‘improv/rehearsal’ where the main flow is rehearsed but each part is more improv. After this challenge presentation I’ve realized the team is used to a style more like that of an ‘overlord.’ I define this as more one singular voice leading the group along and pulling people in to talk at specific times. Last semester my entire team work with a different producer whose presentation style can more closely be related to an overlord style. As a result, our weekly update the previous week went more smoothly since that was the style the group was familiar and had experience with. Going forward I will need to gain experience in this style of presenting to lead them, or work with Richie to prepare him to present instead. Even though we didn’t make it through the challenge we all walked away with what we wanted out of it: direction and feedback on the idea. The idea with which we are moving forward is project titled “0g” where the player is a space squid destroying/infiltrating a spaceship. In previous weeks this was the concept that received the least amount of feedback from the class, yet is the idea the team is most excited to work on for various reasons. Through the challenge presentation we got quality feedback on our concept which can be summed up as a question: why a squid? At that time, we had no concrete mechanics to justify the player character being a squid. 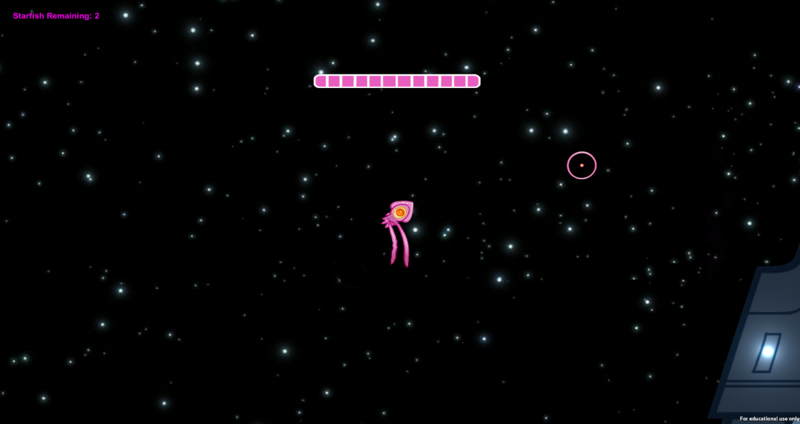 Now that isn’t to say we hadn’t discussed and had planned to implement more squid-like aspects down the line. We had but I failed to communicate this in the presentation format leading to a failure of communicating this to the professors in the class. Instead we believed we had a solid enough basis to focus on more broad aspects such as technical risks and Quality Assurance testing. While these are both important the presentation should have more been directed at our past decisions regarding the three concepts we came up with and the decisions we’ve made up until this point. This aspect of the presentation was communicated with us after challenging, and gave us the freedom to focus purely on our 0g concept. Instead of worrying about all three we now want to properly define 0g to be prepared to take a deep dive into the concept and see where it can go. After learning all this one would expect us to be ready to present this week as well, we learned so much! However, the team has instead decided to wait another week before challenging again. While we feel we are in a solid place to challenge, and know what needs to go into a presentation, there are problems with the current form of the game we want to fix. Namely is the movement system we currently have in place. We feel that to go onto deep dive this is the most important part since it is why the player should feel like a squid. There should be a clear juxtaposition between being a squid in space and being a squid in water, especially with the added mechanic of gravity within the ship compared to dry land on Earth. We’ve learned a lot from our challenge and has allowed us to really focus our efforts regarding 0g, yet we don’t feel ready to challenge again. When we go back we want to be providing an experience that’s at least 150% more squid-like compared to last time. To properly do that we feel it’d be best to finish this sprint focusing on the game rather than preparing to present again. Thank you for reading, see you next week.